Bus transport is plentiful here in Malta, but driving into Valetta from St Julians, where we stayed, is best done following the promenade. From here, you get the best glimpses of all that is Malta. The blue harbours, the colourful boats and the ancient sandstone buildings, built from local materials found on the island. The downside is that it will take you a while, with bumper-to-bumper vehicular traffic the curse of a country with a relatively small population but an infinite dependence on cars. Still, if you are not in a rush, it’s the perfect time to soak up the atmosphere. Just make sure you have an air-conditioned car as having the windows down, inviting in plumes of black smoke and car fumes will make you a bit worse for wear by the time you arrive. It’s worth taking the promenade route for another reason. Once upon a time, two-storey buildings were its mainstay. Today, much of the Maltese coastline is starting to see the increase of construction brought about by an influx of foreigners and an upturn in tourism. Modern highrises are now sitting, perhaps not so comfortably, alongside the character buildings of the past. The gallerias, an important and unique design feature in traditional Maltese buildings, captured my attention immediately, as we drove along. For something so prominent (they are literally on every second building in Valetta), there is very little authentic research to support why they were introduced. Much of the information found on gallerias is conflicting. Some will argue that they became extra rooms, allowed for the breezes to come into the home and also identify social classes. 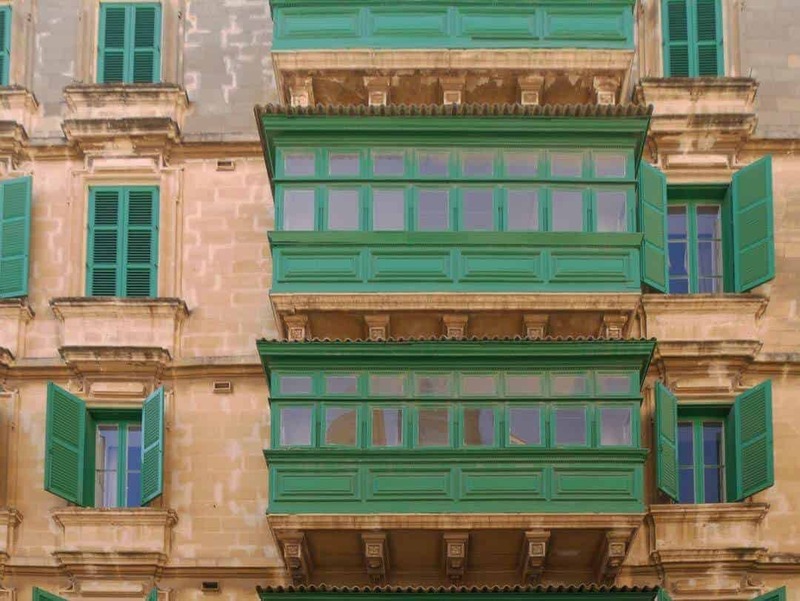 Whatever their origin, they are stunning parts of the Valetta cityscape, with the Maltese government now acknowledging their importance by building protective legislation around their preservation and assisting with grants to restore and retain. Like most of Malta, Valetta has been strongly influenced by a variety of cultures and nationalities. Most significant was the impact of the Knights from the Order of St John and also the British. Built on a hill, between two harbours, the city has fortified giant walls to protect it from those who wanted to conquer it. The walls still contain many tunnels and air raid shelters that were built and utilised during World War Two. Modern Valetta is the heart of Maltese commercial activity, and yet it remains at the heart of the Maltese community and provides a cultural anchor. Located on the Grand Harbour, at 55 metres deep, it is one of the deepest in the Meditteranean. It is almost the most important to Malta. The centre of Valetta is organised into a large grid formation with 12 parallel streets, many of which provide views of the harbour. Built on a hilltop, the streets can be reasonably steep and many still contain the original stone steps, built to help the Knights in their heavy armour ascend the hill. These steps are made from the hardest stone on the island, allowing them to stand the test (and feet) of time. British and other European influences can be seen all over Valletta. The inner city streets are full of great stories and buildings to match. St George’s Square, the Parliament buildings and the Manoel Theatre are all worthy of visits. The ruins of the Old Opera House also add an aura of older Roman times. 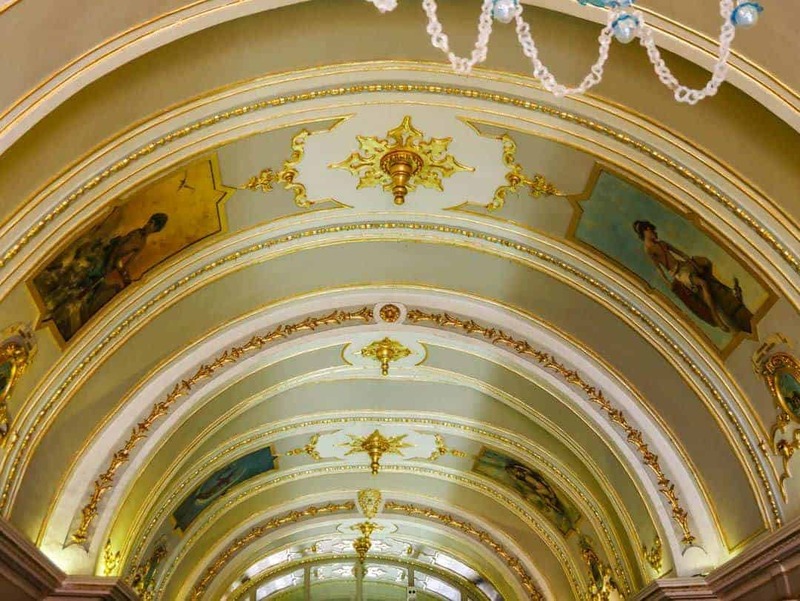 In the centre of one of Valletta’s oldest streets is a glimpse into the grand life of nobility. Casa Rocca Piccola, is still owned by the most current generation of the de Piro family, having been held by them for centuries. Until recently, it was still the home of the 9th Marquis de Piro. Now, it is opened up to the public for viewing. 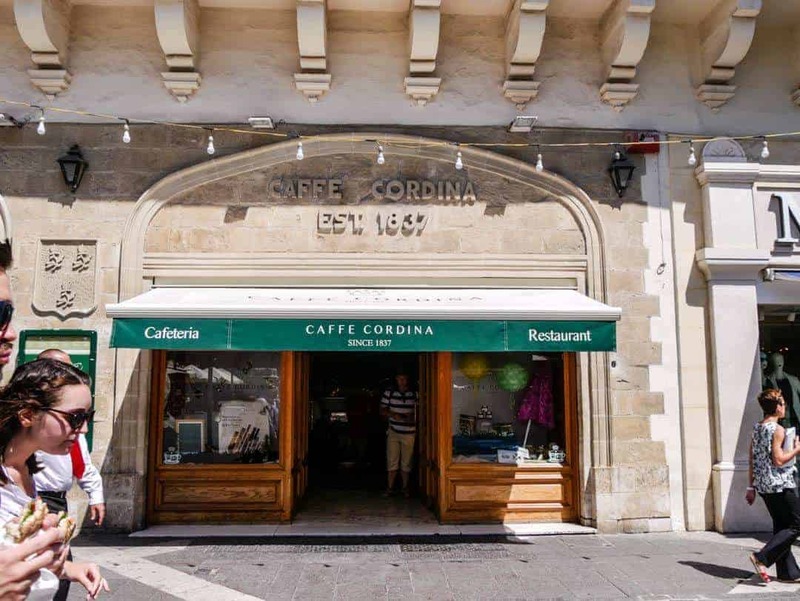 Located on Republic St (Valletta’s main street), Casa Rocca Piccola is open every day except Sunday and public holidays from 10 am until 5 pm. Plan your morning and afternoon activities around the midday gun salute that takes place on the Lower Barakka Gardens. We made our way to the Upper Barakka Gardens for the best seat in the house and a magnificent view over the harbour. It pays to get here about 15 minutes prior to midday to enable you to get a great viewing spot just above the cannons. Getting here early allows you to watch the ceremony of setting up the cannons in readiness for the firing. This is a process that has only recently been reinstated following a period of cease-fire lasting half a century. For hundreds and hundreds of years, this area was used to protect the city from naval assault, and in later years, the gun salute was used to herald the entrance of important naval ships and their dignitaries into the harbour. The gardens themselves were built by the Knights to provide a spot for respite from both their everyday life and also the heat. With large, looming columns around the perimeter, there is more than a touch of Roman influence here. Flowers and other trees soften the sandstone look. Tip: There’s no protection from the sun out here on the stone deck so ensure you have a hat and some water, particularly in the summer heat. Following the midday salute, we headed to Trabuxu, one of Valletta’s up and coming restaurants, with a great reputation. Food is an extremely important part of Maltese culture and they all celebrate its inclusion in their daily routine. Lunch can be a relaxed affair, spending hours over traditional food and wine. If you have the ability to slow down for a little in your day, lunchtime is definitely the time to do it. It also gets you out of the hot sun for a few hours. Butter beans, with garlic, are brought to the table as antipasti to share, whilst we make our food decisions. Service here is swift without being officious. Our waiter was happy to explain the menu to us and explained the specials several times, such was the variety of items to choose from. A daily special of spicy aubergine soup takes the fancy of my husband, and along with the ever-present fresh bread, makes a tasty start to lunch. Bread is eaten simply with olive oil, salt and pepper. Butter was still served with the bread but it seems to be to placate the tourist (especially British) market. We were happy to eat it the traditional way, especially when their olive oils are such great quality. There is a strong Italian influence on the menu here, which we are drawn to on this day. However, traditional options involving rabbit, fish and other seafood are also available. We’ve got a week here, so we are keen to spread ourselves around the food options. A risotto cooked simply with smoked haddock and spinach was cooked to perfection, with just the right amount of liquid being retained in the dish. Paired with a cold glass of Pinot Grigio, my freshly made ravioli with fresh peas, mint and ricotta was light and super tasty. 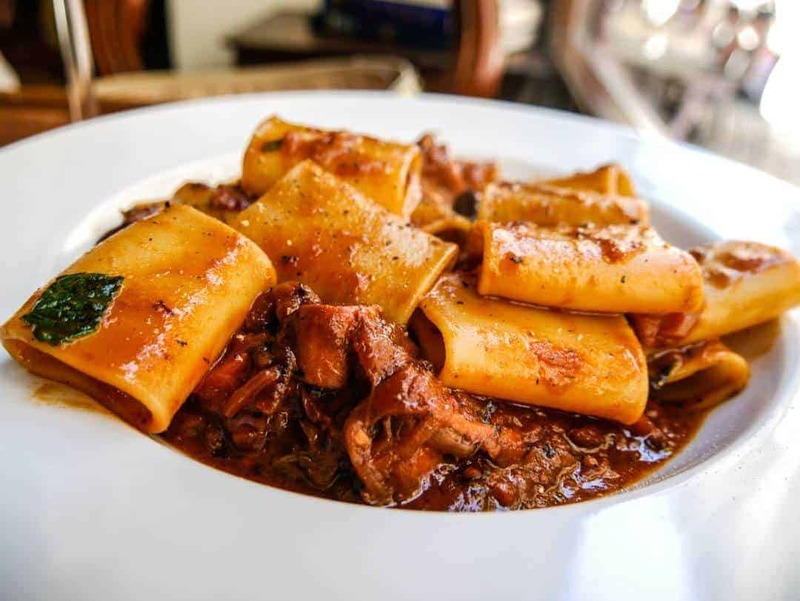 Maria, our guide, opted for a rich rabbit pasta meal, and showing her knowledge of Maltese food, asked for an entree serving. It was still enormous! Three main meals, an entree, sparkling water and wine for two cost €50. Flaky, golden pastry enclosing traditional fillings of pea or ricotta are a must-eat when in Malta. Like most things these days, modern touches have been made to the traditional pastizzi, meaning you can just about find any type of filling. The size of the pastizzi also differs depending on where you are and who is making them. Beware the cheap imitation and always search out who is making them the traditional way. Located on the main street, this cafe is worthy of a visit if only for the beautiful ceiling inside. If you have time, however, it’s the perfect place for a nostalgic morning tea with lots of delectable Maltese bakery items. Our afternoon was filled with more cultural and historical activities, starting with a visit to the St Johns Co-Cathedral, a building commenced in 1571 and completed six years later. At this time, it was a plain church, with minimal decoration. Whilst it remains simplistic on the outside, in the late 16th century, Baroque architecture was introduced transforming this cathedral into one of the most ornate and opulent buildings I have ever seen. Leave yourself enough time for this visit. It’s truly a masterpiece. Italian artist Mattia Preti has become synonymous with this cathedral and his artwork is integral to its historical importance. 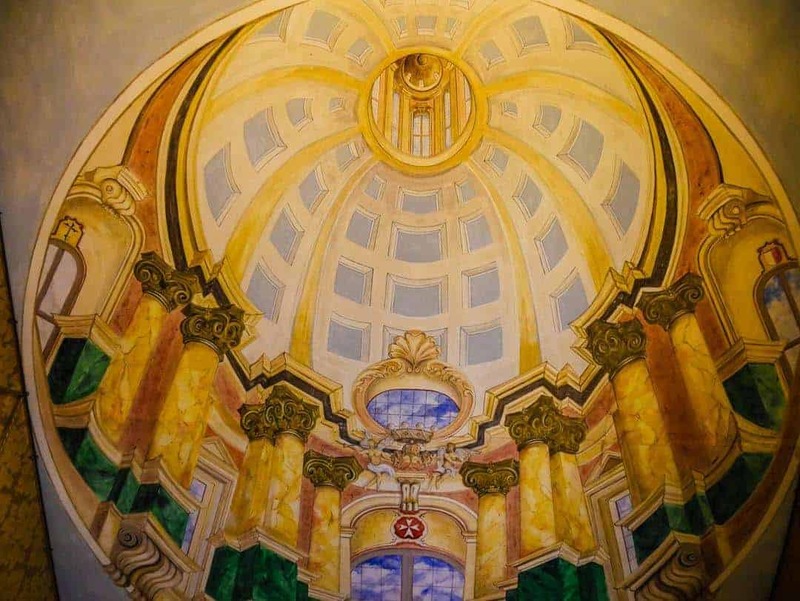 Whilst the vaulted ceilings and walls are adorned with his work, it is the seemingly three-dimensional aspects that bring the murals to life. Much of the walls are covered in stone hand carvings and gilded with 24-carat gold. There are eight chapels inside, each decorated differently to acknowledge the various patron saints. With a myriad of colours, patterns and textures, the marbled floors hold my gaze. Here, traditional Maltese tiles are entwined with the marble tombstones of centuries of Knights, priests and nobility. There’s plenty going on with the Co-Cathedral for future visitors. The crypt will be opened up later this year for the first time and a new project is underway (2017-2019) to display the tapestries which have never been publicly displayed before. A visit to St Johns Co-Cathedral should also be accompanied with a visit to the adjacent museum. The St Johns Co-Cathedral is open on all days except Sunday and public holidays. Check the website for entrance prices and other details. The easiest way to get to Valletta is by public transport. Valletta is the transport hub for all of Malta so buses operate regularly and are inexpensive. A ferry also leaves from nearby Sliema and crosses the harbour. Smaller boats also operate from the Three Cities and are a fun way to see the harbour as well. Getting around Valletta itself is easily accessible on foot. Despite my earlier comments about Maltese traffic, the streets of Valletta are relatively quiet with the centre being pedestrianised. Many airlines, including low-cost airlines, fly regularly to Malta from the United Kingdom and Europe. The majority of European locations within a three-hour flight. We stayed at the Hilton Malta, about 30 minutes away in St Julians. This allowed us easy access to all other parts of the island. Despite it being the capital city, there are surprisingly few major hotels right in the city. The Grand Hotel Excelsior and Hotel Phoenicia Malta are the only five star hotels right in the city. There are also some palaces that were owned by the Knights that are now B&Bs. I highly recommend spending at least one week in Malta and making sure you have access to public transport or even a hire car. 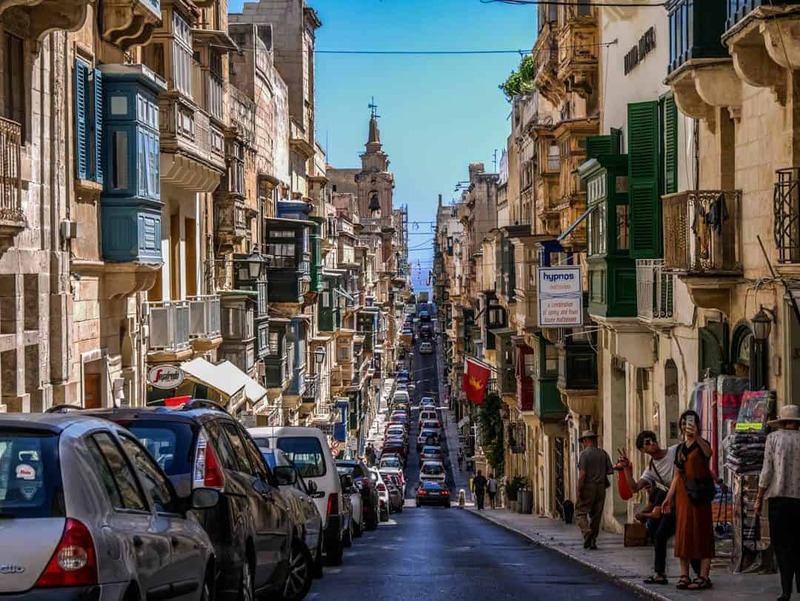 Using Valletta or St Julians as a base means you are generally only 30 minutes to an hour (traffic depending) from the major locations and points of interest. Once you have made the decision on where to stay, knowing what to do in Valletta is the easy part. Looking for travel guides. Click on the images below. We were guests of the Malta TourismAuthority for the duration of our time in Malta. We greatly appreciated this, but as always, all opinions are always our own. A very special thank you to Maria, our personal, professional and wonderful guide for the week. Great photos! Malta was one of our unexpected highlights of 2017.
you know Kirsty I didn’t even see that. THe gun salute sounds fun Kerri; like a throwback to a different time. Or a little like a funny cartoon from back in the day, when characters always seemed to be setting off cannons to fight one another. Malta feels charming and inviting. Awesome post; super informative, and I love these pictures. I always knew Malta as an island that is loved by Film industry all over the world for the filming Harbours. Thank you for introducing me to Valletta – those 12 lanes look perfect for walking & soaking in the culture. I totally understand that as it hadn’t really been on our agenda either but we are so pleased we went. Great post! Your photos bring alive the achrms of this city. I love walking and exploring cities. I’ve wanted to visit here for a while, mainly to see the juxtaposition of old and new as you described – I like that it appears to be an evolving city. It’s so funny that there is little history about the gallerias, but they are pretty! A very informative post. I always enjoyed Malta very much, but I did notice a little chance in the attitutde towards tourists in the last few years. No idea if it was just coincedence or the locals are just getting a bit tired of the many visitors. I also really enjoyed the saluting battery! Was awesome! Hi Thomas I certainly didn’t notice this luckily. 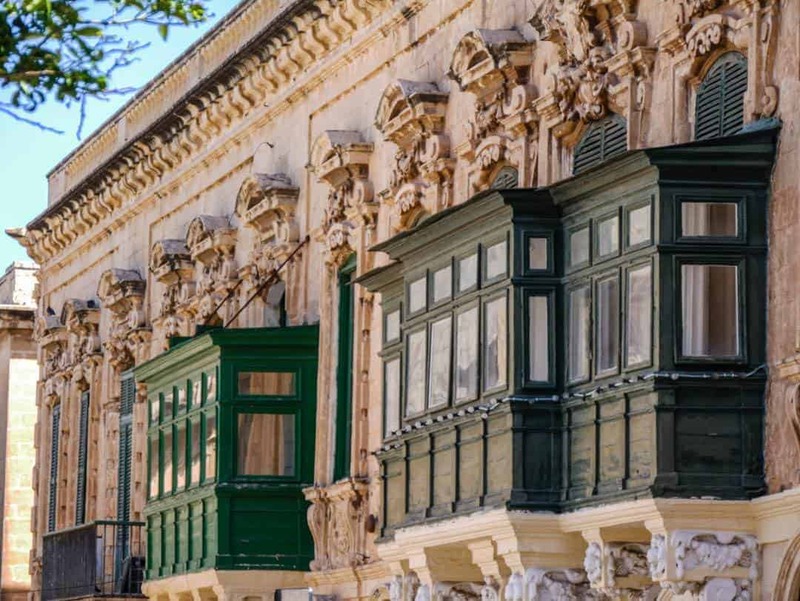 It looks like there’s some really interesting and beautiful architecture and historic buildings throughout Valetta – I really like your suggestion of walking the streets and laneways. I might make a note to take decent walking shoes though since that hilltop could be a bit challenging .. especially in the summer heat! You really can see the British and other European influence! The midday gun salute at the Lower Barakka Gardens looks really interesting, and beautiful harbor views. Definitely won’t miss that, thanks for the tip! Thanks for the tip about having your car windows closed. Valletta looks so beautiful, it invites going around in a convertible. I didn’t know those are called gallerias, I thought they’re just closed off balconies LOL They look really lovely though! I would definitely visit Valletta based on your cityscape photos alone. Despite looking like a Greek Island, it’s definitely not the location for a convertible. I really enjoyed Malta. I was there in September and the weather was just spectacular, like July, August weather back home in Toronto. I definitely agree with you about the Gallerias. Love those splashes of colour against the sand brown buildings. My Airbnb was in Sliema so I had to ferry over to Valletta every time I wanted to visit. This post brought me back but Valletta is still fresh as I was there last year! I do wish I spent more time exploring the food as you did. I would still have loved to catch the ferry across the harbour. Amazing place Christopher. Loving every micro-inch of this city! Is that a crazy thing? The food, the streets, the promenade, the harbour and the architecture…I can feel it all seeping into my consciousness already. Isn’t Valletta the 2018 European Capital of Culture? I am going next year!! simply great..i loved the detailed write-up, will love to visit these places.photos are also awesome.